On March 9, 2016, Vermont Governor Peter Shumlin signed legislation (H.B. 187) making Vermont the fifth state to enact a statewide paid sick leave law, joining California, Connecticut, Massachusetts, and Oregon. In 2018, Vermont’s new Paid Sick Leave rules came into full effect. For companies who have not had a formal paid leave policy in the past, it’s important to know how to comply with the new regulation to provide paid sick time to your employees. A great resource for information in plain language is this website by the Attorney General’s office: https://www.uvm.edu/consumer/paid-sick-leave. Employers must accrue paid sick leave for all employees--at least one hour of sick leave for every 52 hours an employee actually works. The accrual of sick leave started on January 1, 2017. If you work a 40 hour week 52 weeks a year, then that totals 2080 hours. That means you’d accrue 40 hours (5 days) of paid sick leave per year. In reality, many employees do not work a full 2080 hours in a year. Vacation time, holidays or other paid time off (PTO) do not count towards the accrual. In 2018, an employee can use up to 24 hours of earned sick time a year. Starting in 2019, an employee can use up to 40 hours per year. In the first year of employment, employees can accrue sick time but as an employer you are not required to give paid sick time until they have been working for you for a year or more. Salaried (exempt) employees are assumed to work 40 hours a week for the purposes of sick leave accrual. Sick leave is accrued for any work performed in VT, regardless of whether the company is based in another state or the employee resides in another state. Fines for non-compliance: employers can be fined up to $5,000.00 by the State for failing to comply with paid sick leave regulations. So, how do I track this? Here you can change the labels of how these categories show up on your pay stubs. Here you can choose how you want to track or accrue the Sick hours. You have two choices, just set the total at the beginning of the year (this is best for full time salaried employees who you feel confident will likely be with you for the next year or more). In this example, the employee is set up to have 5 sick days and 5 PTO days per year, if they work full time. Sick hours can carryover from year to year but you can cap the maximum at 40. This sets the company defaults. 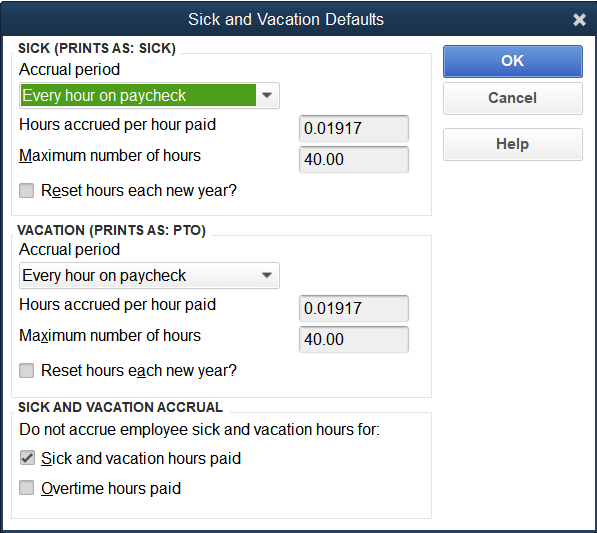 Now you can adjust how much sick time and PTO each employee earns. Now, go to Employee Center. Here you can customize on an individual employee basis. If you have not been tracking sick time previously, you’ll want to make sure you set it to start accruing sick time on 1/1/2017 or the employee’s start date, whichever is later. Here you can also choose to set up to either grant the full 40 sick hours from the beginning of the year, or have it accrued for every hour worked. If you are tracking sick leave for the first time, you may need to go back through your payroll records to check how much has already been used in 2018. COMPANY offers paid sick time for employees in compliance with Vermont’s paid sick leave law. All Full-Time Regular and Part-Time Regular employees working more than 18 hours per week are eligible for paid sick leave and can earn up to (5) five paid sick days per year. Eligible employees will accrue (1) one hour of sick leave for every (52) fifty-two hours worked. Between January 1, 2017, and December 31, 2018, employee’s accrual and use of sick time is limited to 24 hours (or 3 days) in a 12-month period. Beginning January 1, 2019, employees can use up to 40 hours (or 5 days) in a 12-month period. Upon hire, employees will start to accrue sick time, but cannot use their sick time until after their (1) one year anniversary of employment. An employee can carry over any unused sick time at the end of the year in which it was accrued, but the employee is not entitled to take more paid sick time than what the law provides in any year. Once you update your Employee Handbook, you’ll need to notify employees of the new policy and hand out copies of the new Handbook. You also need to post the VT Department of Labor’s Earned Sick Time poster in a location where your employees can see it. Obviously, this information is specific to Vermont, and law varies from state to state, but the process of setting up and tracking paid sick time in QuickBooks is the same regardless. This blog post is based on research and interviews with State of Vermont department representatives. HELM cannot be held responsible for the legality or accuracy of this information, as it changes over time and varies from state to state. If you have questions about how to implement paid sick leave in your Vermont workplace, please contact the Department of Labor.